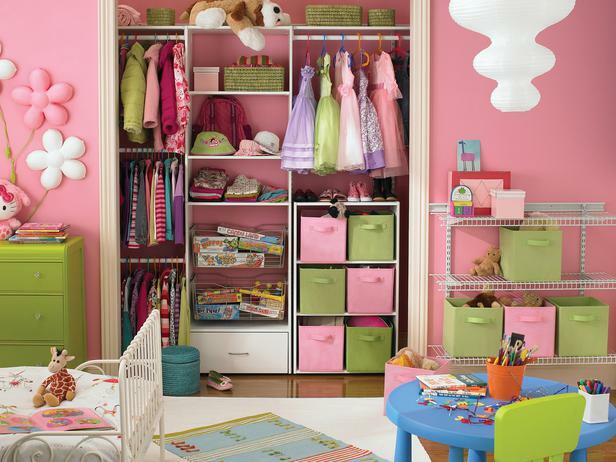 When designing a closet for a girl's bedroom or nursery, keep the space flexible so it can grow with your child. Browse photos of girls' closets and get tips for keeping your child's closet organized. Typically made from coated wire or laminated wood, closet systems can add both beauty and function to a girl's room or nursery. A laminate closet system in traditional white complements this nursery's pastel color palette. Plus, the shelves and drawers in the center of the closet provide much-needed storage space for diapers, blankets, toys and more. Economical and easy to install, wire closet systems can be adjusted as your child grows and her storage needs change. Most kits come with shelves and rods that can be easily rearranged and enhanced with accessories, including shoe racks, hooks and baskets. A typical closet used to consist of a single rod with a shelf above, but new organizers let you customize your closet based on your storage needs. In this girl's closet by Rubbermaid, a double-tiered hanging system offers plenty of room for clothes, while wire shelves accommodate shoes, toys and folded garments. Canvas bins, baskets and other containers can be a practical and aesthetically pleasing way to keep a child's closet organized. Designate containers for toys, games, art supplies and other items so she knows exactly where things belong. Keeping toys and personal belongings within reach is the objective as your young one begins choosing her outfits and learning to clean up. Adjustable shelving is a great storage solution for a child's closet, because it allows for flexibility as your needs change. Closet storage can be both functional and decorative. Look for bins, baskets and other containers that coordinate with the color scheme of the bedroom. Closet organization systems can help you designate separate areas for shirts, pants, skirts, shoes and toys. Creating zones in the closet makes clean-up easier and teaches your child how to stay organized. Folding closet doors can pinch little fingers. To keep a child's closet easily accessible but concealed when not in use, consider replacing the doors with an attractive curtain. In a narrow closet, it's especially important to make smart use of space. Save lower shelves for favorite clothes and toys, and use higher shelves to store out-of-season clothes and other infrequently used items.